Read the keynote speech that set the tone for this year's Sustainable Brands '08 conference in Monterey, CA. Jacquelyn Ottman recapped the year's changes in the green marketplace and once again bestowed upon the attendees exciting strategies for the future. Jacquelyn Ottman outlines why the Toyota Prius is a prime example of how to effectively market a "green" product—do so with the direct benefits in mind and don't showcase the environmental attributes until you've captured the mainstream. 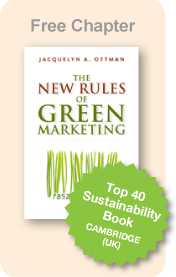 Jacquelyn Ottman explains why green marketing in 2008 should be approached differently from years past, and outlines some key things to keep in mind when traversing this year’s green landscape. With the myriad of eco-logos donning packaging of many products today, how does one know which are credible and which are self-proclaimed or simply a marketing ploy? In this article Jacquelyn Ottman touches on the key components of a concrete eco-logo and explains why the benefit of using them as a marketing tool is still up in the air. Discusses how green marketing practices have failed to evolve significantly in the past 20 years and that businesses must look towards eco-innovation in order to address the pressing ecological issues of the future. Along with the five rules of green marketing, this article gives four detailed examples of companies that have successfully won over green consumers while grabbing market share. With environmentalism fast becoming embedded into the American culture, eco-innovation-not incremental product improvements- will need to become practiced by forward-thinking businesses. Many product designers are having the opportunity to design with a lighter environmental footprint. Jacquelyn Ottman highlights strategies for empowering consumers to act upon the environmental issues that concern them.